Route: Hart Montague Bike Trail, various streets through and out of Montague, Scenic Dr., Memorial Dr.
Terrain: Mostly flat with some hills. Scenic Drive had light traffic, but no shoulder and a deplorable road surface condition. Weather: High 60s at the start, 80+ degrees at the end. Sunny. Not really any wind. We woke up this morning to the sunrise over the Silver Lake sand dunes. This is a great stop on the trip around because it is like the Michigan ad council filmed their ads here. You just have to see it to believe it. 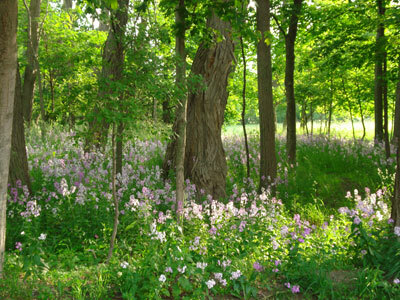 We headed out of town to more Michigan hills but within 5 miles we got to the Hart Montague State Park Trail. 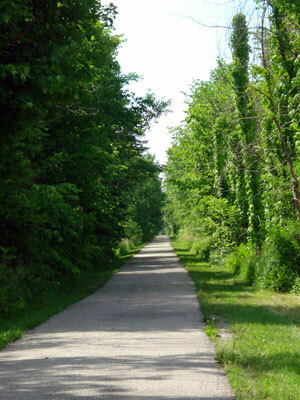 This was the first Michigan rails to trails path and it was 20 miles long and paved and flat. We stopped for our 25 mile break in downtown Montague. We had had trouble with our internet connection last night so we were looking for a place to double check for a hotel for the night. I saw a cafe across the street. I walked over and asked if they had WI-FI. The waitress asked me what is a WI-FI? I immediately knew this spot was not hot. After Montague we re-entered Michigan onto 10 miles of bumps. The road was called Scenic Dr. It went through some beautiful areas but it was 10 miles of speed bumps every 10 feet and a crumbling right edge, so we missed the beauty. I renamed it Lumpy Lane. We ended up in downtown Muskegon at the Holiday Inn. We have decided that to make the trip more fun we would try to keep the rides to 50 or so miles per day and explore the towns. Today we enjoyed Taste of Muskegon…we tasted 10 different beers. I feel like we are on the home stretch and we are just having fun at this point. 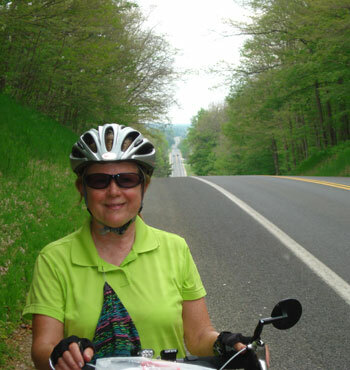 Route: Zigzagging south and west on paved country roads to Ludington. Then Lakeshore Dr., Business Rte. 31, and B15. Terrain: Mostly undulating with some flat and some hills. 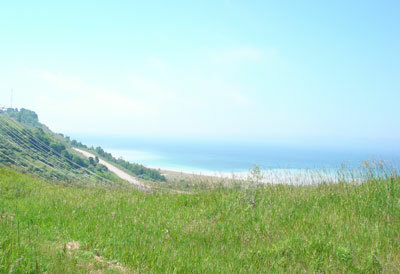 The hills were steep just south of Ludington. Weather: 64 degrees at the start, 78 degrees at the end. Sunny. WNW wind at 5-10 mph. I don’t know if we are getting stronger or just feeling the afterglow of a lazy day off. Today’s ride was on peaceful rolling hills with lots of forests for the most part. For the first time on our trip we had to make advanced reservations to insure a room at the other end. Our first night in Zion we had a reservation but at least half the hotel was empty when we got there. We always look online at the motels for the next day but never actually book ahead because we like to keep our options open . I generally do the motel shopping but for some reason Cindy checked a Comfort Inn and it was booked for the weekend. Oops!!! It’s fathers day weekend. I called eight more places in the three towns that were on our route and found only one that had a room available so I booked it, Dan-o. As it turns out it’s kind of a resort on Silver Lake and right on the beach. It’s a little pricey but it beats sleeping on the dunes. I am happy to see the beaches full of families, boats zooming around the lake and the motels full. Maybe, just maybe, the economic freeze is starting to thaw. Weather: Mid 70s, mostly cloudy, blustery. 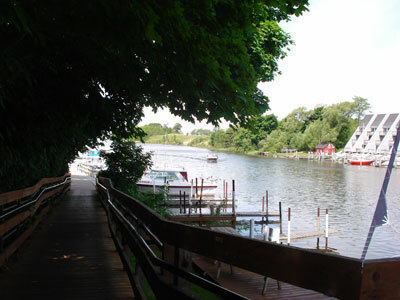 We are enjoying our day off with a little exploration of the Manistee Riverwalk, the Marina area, the beach and the historic downtown section. This part of Manistee is very charming. Otherwise today is laundry, read and sleep day. We need to do a little computer searching for tomorrow’s destination. Our route guide directs us to a state park along the lake and we are not into sleeping with Smokey the Bear. Terrain: Mostly undulating, a little flat, some hilly - including a few long and steep hills. Weather: Mid 60s warming to low 70s. Mostly cloudy with a few sprinkles the last 20 miles. No wind at first then light from the southwest turning to be from the west. I think it might rain tomorrow but if it doesn’t I have officially declared it a rain day because we need a rest. We rode 60 miles today and half was in hills, big hills. Riding out of town this morning started with a one mile climb followed by a half mile decent and another one mile climb. We did have about 20 miles today that were relatively flat but the rest was pure Michigan. I can’t wait to enjoy the rest of the way south. After climbing for a few hours I stopped at the top for a drink of water and a breath. My view was the rolling hills with neat farm fields and the lake in the background. I think we were around 1000 feet above the lake at that time. I wish we had taken a picture. On an ecological note we observed in Wisconsin that the farmers seemed to be dealing with too much rain and soaked fields and on this side of the lake people are sprinkling lawns. We rode through Manistee this afternoon. It looks like a poster child for the rust belt. We will check around and see if there are any points of interest tomorrow. Terrain: Hilly on M31, flat on the bike path, very hilly on M72 with a narrow shoulder most of the way. Weather: 68 degrees at the start, 74 degrees at the end. Humid and mostly cloudy. Very light wind at first from the west and then from the north. Today’s ride from Elk Rapids to Empire was a real calorie burner with 32 miles of major hills plus an 8 mile trail from Acme through Traverse City. The vistas along the way were breathtaking, that is if you had any breath left after climbing the hills. To give you an idea of how much climbing we did, the last 5 miles into Empire were all down hill. This was our 6th day in a row of riding and we are both a little tired. The weather has been so nice that we plan on pushing on tomorrow. After cleaning up we took our walk about and found Empire to be a bit of a hippy town. From the looks of the locals there are a lot of Grateful Dead fans that live here. Antiques, ice cream and fudge seem to be the major industries. Our apologies that this one got posted a day late - we didn't have an internet connection. Terrain: Undulating. Fast traffic and narrow shoulder on M31. Weather: 70 degrees at the start, 80 degrees at the end. Sunny and very slight W wind. When we were eating breakfast this morning Cindy observed that all the posters on the wall were about Boyne Mountain Skiing. We had spent a good part of Monday climbing and as we got on our bikes I looked around and everything I could see was higher than us. My first thought was this is going to be a tough day biking in ski country. As we left the motel parking lot the road (M119) headed south and downhill. I was nervous about the downhill because they invariably lead to an uphill. We did not have to pedal for two and a half miles. At this point I am beginning to panic. I am imagining the rest of the day riding up the mountain. Instead we reach this unbelievable paved bike path that runs more or less along the shore for 22 miles with no hills. The path ends in a great little city called Charlevoix where they plant petunias all along the streets. We had planned on only riding 44 miles because we expected hills. Then because the first 25 miles had no hills we went on to Elk Rapids at 60 miles. Much of today’s ride was through long rolling hills of apple and cherry orchards with an occasional view of the lake off our right shoulder. Weather: 70 degrees at the start, upper 70s at the end. Sunny and no wind. Up up and over is the way we felt today as we took a 20 minute ferry ride from the island to Mackinaw City. 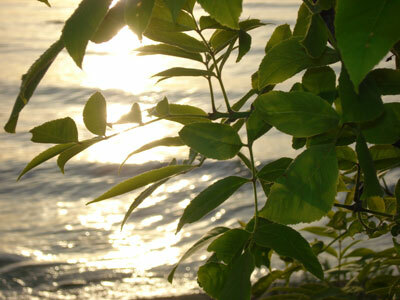 We then began our southward journey down the east side of the lake into lower Michigan. When we started this trip two weeks ago the weather was rainy, windy and cold and today was the 180 degree opposite. We like to stop every 15 to 20 miles to stretch and munch on an energy bar. On one of our stops today the road was no more than 50 feet from the water so Cindy returned voice mails and I walked down to the water's edge. 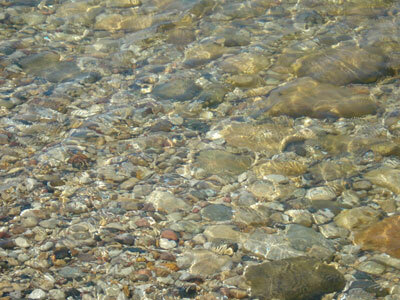 The water was so clear and still that it looked like a huge fish tank with the colored rocks on the bottom. We also rode through a magnificent woodland tunnel made mostly of pine trees (M119). As we entered the sign said ”20 miles narrow winding road”, they left off the hilly part. I’m sure they meant that as a bonus. The road was about the width of our driveway and in beautiful condition with almost no traffic. It truly was a woodland tunnel when you entered it the temperature dropped 10 degrees.